The Bay of Islands with its sheltered waters, temperate climate, historic towns, sleepy bays, protected inlets, sweeping stretches of golden sandy beaches, and clear waters is a world-renowned cruising destination. It is a year-round maritime playground that locals cherish, and visitors return to again and again. With the numerous Islands and inlets, there is plenty to explore and enjoy. Once you’re around Tapeka Point – just north of Russell – you’ll enter a maritime adventure playground with an abundance of wildlife including penguins, dolphins, marlin, whales, gannets and more. The seven main islands in the eastern Bay of Islands have been pest mammal free since 2009, and the natural ecosystems are being restored. Bringing back birdsong to the islands, note by note. Thousands of trees have been planted, and five rare and endangered species have been reintroduced. Use our interactive map to explore some of the highlights you won’t want to miss. For those that love nature, beaches and water activities, it’s paradise. Well charted, easily navigatable, sheltered waters. We will give you a thorough briefing and a local cruising guide with paper charts, if you are bringing a smart device along you may like to download your own GPS/Chartplotter app such as Navionics. The Bay of Islands enjoys a semi-tropical maritime climate, created by the southerly flow of warm water from the South Pacific. Sailors can enjoy a warm climate throughout the year, with temperatures reaching up to 25°C (75°F), even during winter. Occasionally a light frost can occur. Summer temperatures in the Bay of Islands can reach into the low 30°C’s (around 90°F). The warmest months are January and February. 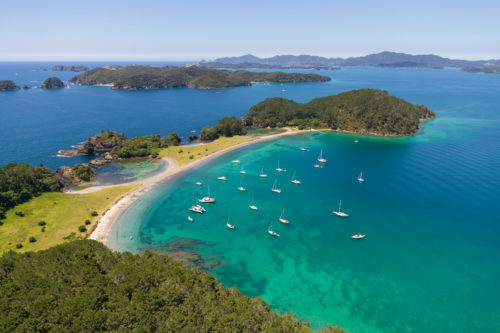 Average daily temperatures in the Bay of Islands range from 15°C to 27°C (60°F to 80°F). The Bay of Islands has an average yearly rainfall between 1500mm to 2000mm and enjoys an average of 135 sunshine days. Ensure you are familiar with the maritime regulations as they apply in Northland. What else to do besides sailing in the Bay of Islands.